Bonfire Films, led by husband and wife team Corey and Haley Norman have established themselves as quality horror filmmakers in recent years. Known for ghostly feature The Hanover House, 80’s inspired, urban legend Tickle and more recently for adapting Stephen King’s short story Suffer The Little Children to the screen, the award-winning Maine based duo offer up a different kind of beast for this year’s Damnationland Festival with White Drift. White Drift centres on Peter (Sean Carmichael) an ex-army recruit passing through a small town in Maine to seek out an old friend and fellow soldier. The locals immediately notice something isn’t quite right with the ambiguous drifter as he experiences strange withdrawal symptoms. Intrigued by the mysterious Peter is waitress Abby (Kristi Ray- Pieces of Talent) who offers him her kindness and appears genuinely concerned. Unbeknown to her Peter harbours a dark secret and faces a moral dilemma that inevitably will result in devastating consequences. There’s always a fascinating aspect to the werewolf as a monster in the moral sense and the concept is executed well in this short. With heightened sound effects, Norman establishes a sense of what Peter is experiencing and how the physical changes are affecting him. It’s a real build up of slow burning tension before the wolf is unleashed on the audience, allowing a sense of gut-wrenching dread. A melancholic tone is presented throughout, aided by grey visuals within the cinematography. It’s certainly a brave move portraying the werewolf concept as a metaphor for PTSD after army life especially as it’s such a raw subject that holds such relevance in our society. However, the subject matter does work creating a powerful and dramatic narrative. Both Sean Carmichael and Kristi Ray are impressive in their roles. We’re only experiencing their story for a short time but they manage to draw us in with their naturalistic performances. Carmichael portrays Peter as troubled, confused and frightened as he searches for the only person in the world who can help him. Kristi Ray plays Abby as sympathetic and genuine but also curious as to what’s wrong with the mysterious stranger. Funds for the special effects were achieved through Bonfire Films IndieGoGo Campaign which allowed the team to animate a ferocious looking werewolf for the pinnacle moment in the movie. The appearance of the Wolf brings in an 80’s B-Movie vibe to it and is more impressive that some werewolf guises that have been created on a bigger budget. White Drift is an example of a crowd-funding movie that is of a high standard and exceptional quality. Bonfire Films Writer and Director Haley and Corey Norman. Maine-based production company Bonfire Films are a rising name on the indie genre scene and there’s no one better than them to take on the works of the great Stephen King. 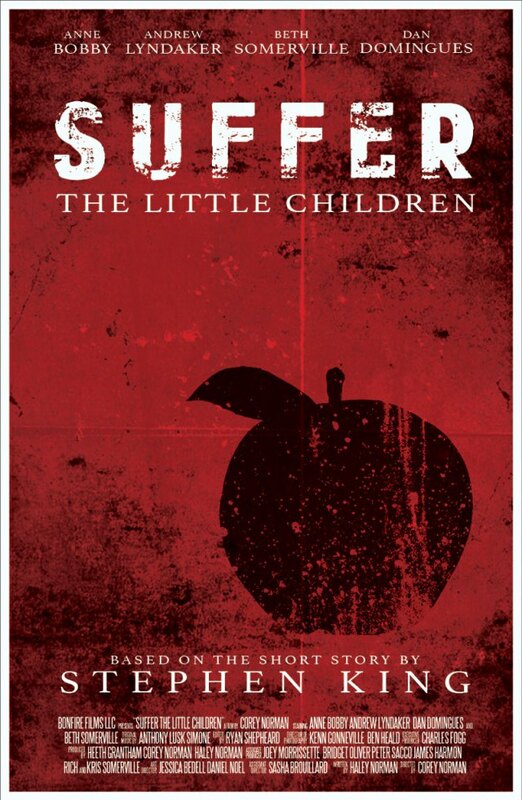 Suffer the Little Children is the latest crowd-funded film from Husband and Wife team Corey (Director) and Haley Norman (Writer) and an adaptation of the short story of the same name from King’s 1993 anthology Nightmares and Dreamscapes. Suffer the Little Children provides Bonfire Films with another solid short film that’s both darkly twisted and entertaining. Having previously starred in Norman’s feature film The Hanover House, Anne Bobby of Nightbreed fame makes another return to the horror genre taking on the role of the paranoid Ms. Sidley; an ageing primary school teacher who has suspicions that something’s not quite right with her young pupils! Bobby steals the show as the flustered, lonely teacher with a morally questionable agenda. Ms Sidley is a complex character in which Bobby portrays spectacularly. The film translates over from the source material incredibly well; whereas with a written story we’re provided with description and a deeper understanding of what a character is thinking, in film its down to the visuals and Suffer the Little Children is reliant on Bobby’s performance. In twenty-two minutes, she does a tremendous job by bringing this emotive character to life who we can empathize with on some level but also leaves us wondering if she’s unhinged or paranoid? The second stand-out performance comes from Andrew Lyndaker, who previously starred in Norman’s short Tickle (2014). Lyndaker is a promising young actor and does an effective job at playing the “creepy child” archetype in this. “Tomorrow, something bad will happen” his school-boy character Robert warns Ms. Sidley convincinly, creating unsettling tension. Norman is a fan of old-school horror which is evident in the previously mentioned Tickle and his 2013 offering Natal. Suffer the Little Children most certainly has a 80s vibe about it and echoes back to King’s 1984 classic Children of the Corn in tone and is slightly reminiscent of A Nightmare on Elm Street (1984) with the idea of something shadowy lurking in the school hallway. For a film with a chilling subject matter, Suffer the Little Children is vibrant in its lighting and cinematography, with the brightly lit class room signifying innocence which makes it all the more creepy as the film unfolds. As with Norman’s previous films, Suffer the Little Children is expertly-shot and highly professional. Its an ambiguous film that raises moralistic questions. While its a little gory in places, the real horror lies in the psychological aspects. Its no surprise that Suffer the Little Children has already won TWO well-deserved awards at this year’s HorrorHound Weekend all the way in Indianapolis for Best Short Film and Best Actress for Anne Bobby, which was tweeted by her former director, genre legend, Clive Barker. With another successful film in the bag, I can’t wait to see what Bonfire Films have in store for Horror fans next!